LAS VEGAS – Sandy Gwatney has something in her trophy case nobody else can claim. For the first time in ProRodeo history, the same person was selected as the Secretary of the Year in both the premier organizations – the Professional Rodeo Cowboys Association and the Women’s Professional Rodeo Association – in the same year. “The best part of my job is being able to help the cowboys, cowgirls and committees and try to make their jobs easier,” said Gwatney of Marquez, Texas. This is the Montana Silversmiths’ PRCA Secretary of the Year buckle Sandy Gwatney was given on Nov. 30. 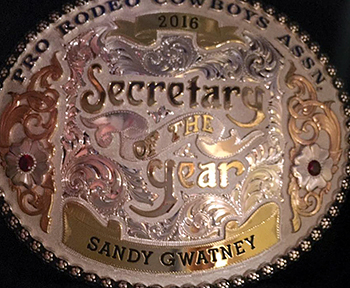 The next day, she was given a plaque for being named the WPRA Secretary of the Year. That’s a big reason she earned both honors. She received word Oct. 3 about the WPRA honor but didn’t know about the outcome of the PRCA voting until the year-end awards banquet that took place Nov. 30 in conjunction with the sport’s grand finale, the Wrangler National Finals Rodeo in Las Vegas. The announcement confirmed what members of the PRCA had decided through a vote of the top five secretaries, and it allowed Gwatney to offer her thanks to a packed ballroom at the South Point Hotel, Casino and Spa. It did. The PRCA features thousands of members, and Gwatney collected the majority of the votes in 2016. “She puts all of her effort into her job and is devoted to it,” said JoJo LeMond, who finished sixth in the steer roping world standings and 10th in the all-around race. “She’s worked all ends of a rodeo, not just as a secretary. She’s been sorting cattle, running a neck rope and doing all sorts of other things, so she understands all aspects of a rodeo. It’s true, and it’s something in which she takes great pride. But that’s not all she does. As secretary, she has her fingers in every aspect of every rodeo she works. She is the greeting face for every contestant who enters her work space and makes sure the officials and other rodeo personnel have everything they need. That group includes her husband. John Gwatney is a hard-working and well recognized chute boss in ProRodeo. The couple travels together and shares successes. “This is huge, because we travel about the countryside doing what we love,” said Sandy Gwatney, who was raised in northern California. “This is about the love of the game, and we can never say it enough. I think it’s a huge part of my life that I got to compete with him, that I got to haze for him when he was still bulldogging. She has worked as secretary of the Clem McSpadden National Finals Steer Roping each of the past three years. Over her career, Gwatney has timed that same championship as well as the Wrangler National Finals Rodeo; she also has been the NFR’s assistant secretary. Each step has served as a testament to her talent and passion. “If you don’t love what you do, don’t do it,” she said. “I do this because of the people. I like to go all over the country and see all the people I only get to see once a year. It’s like spending time with family. The rodeo family is large, and generations run deep. This year they honored one of their own in Sandy Gwatney.